I found this recipe on Pino Luongo’s blog, and it also appears in his cookbook, La Mia Cucina Toscana: A Tuscan Cooks in America. 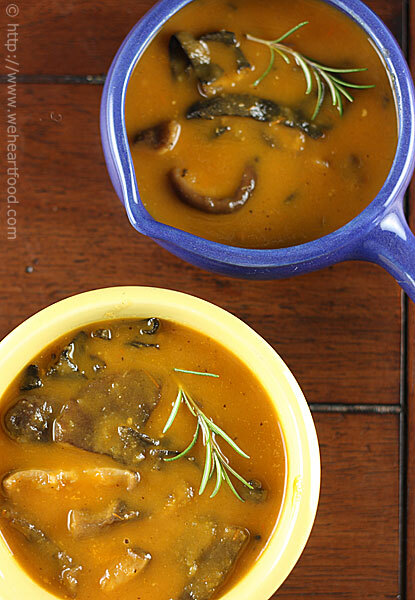 Frequent readers of this blog know that Lisa and I both love mushrooms, and the prospect of a creamless creamy soup sounded really appealing. We had also just picked up a big bag of black trumpet mushrooms at the Farmers Market and were eager to try them out. While simple, this isn’t a quick recipe — the tomato puree bakes for an hour and a half — so if you’re going to tackle this one, save it for a weekend. Unless, of course, you don’t mind waiting for a good thing.